Specialist and unique transgenic models demand a large up-front investment of time and resources. Even once they are established, the costs continue to mount as day-to-day upkeep of an established cohort requires costly facility space and animal care technicians. On-going monitoring for genotype and genetic drift will be necessary. Moreover, in today’s complex research landscape, animal models are not just a static research tool – they are a potential variable in your research. This variability becomes a significant risk to research outcomes, budgets and timelines. Whether working with immunocompromised, transgenic or immunodeficient models or even microbiota research projects, cryopreservation and outsourced contract breeding allows you to maintain a strain at a specific genetic state in time and, when needed, you can refresh the colony back to that genetic moment. As well as safeguarding your research models – and the integrity of your research – cryopreservation can reduce the space and resources required for animal care, and allow your lab to focus instead on actively-used colonies. This eliminates potential waste from continued breeding when a study is on hold. Licensing bodies look favorably on this 'welfare mindset,' as it helps demonstrate the three R’s—replacement, reduction and refinement, and responsible model use. Cryopreservation is also helpful when working with countries where sending live models is cumbersome, lengthy and paperwork-intensive, such as Australia and Japan. Using cryopreserved material to transport a line allows you to bypass this lag time. Cryopreservation should take place when the proper background has been established for the line, and before the genetic background has a chance to shift. Alternately, you could freeze as soon as the 'founders' or first transgenic animals are produced. Ideally, cryopreservation should also then take place at key stages of breeding multiple transgenic lines, in order to capture an expensive, complex genetic status. Once you’ve decided the timeline for cryopreservation, the next decision is what technique to use: sperm or embryo? Sperm cryopreservation is the most cost effective, but only provides one copy of the genome. Typically, a minimum of two males can provide enough material to freeze a line. Embryo cryopreservation, on the other hand, generally requires twenty females and ten breeder males. 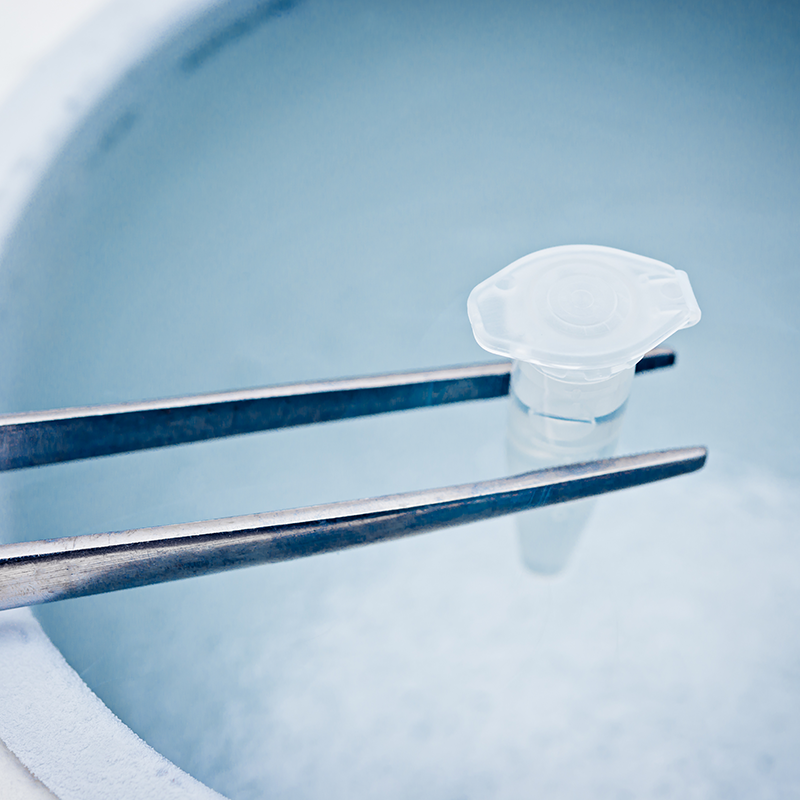 While the cost of embryo cryopreservation is higher, it ensures an exact copy of the genotype. Further, depending on whether the model is bred as a heterozygote or homozygote, a high number of embryos are captured – one hundred fifty to three hundred! With all the effort that goes into developing and maintaining a line, it’s essential to ensure that cryopreservation is undertaken with the same dedication to quality control. Make sure your provider can validate and demonstrate (both before and after cryopreservation) that the material is properly preserved and can successfully reproduce live animals. Ask potential providers how they perform quality control. Many providers will offer dual storage of frozen materials, which will guarantee that at least one set remains viable in case of facility failure. Now that you’ve frozen your vulnerable strain, when is the best time to revitalize it? Planning ahead is imperative. It typically takes seven to ten weeks to reconstitute a cryopreserved line: one week to set up the process, three weeks for pregnancy gestation and a minimum of three weeks for monitoring. This is quicker than the time it typically takes to recover a live, non-producing line, which can take up to 15 weeks.